This month has been a challenge for me in terms of approaching a few milestones. Not only was my middle son a senior with college on the horizon but also approaching a major birthday. I had all sorts of expectations in the past as what my behavior would be like after that age. Honestly I was not even wanting it to come at all but that wasn’t going to happen. I began to understood why people are sensitive about their age. It was then the day after that I realized that it wasn’t a big deal. Being 50 is just a number and there wasn’t a big letdown or sadness. Time is a gift and I’ll embrace like that. I’ll continue to just being me and shine on. After being released from the hospital emergency room, I became more thankful and grateful. I noticed all the beautiful colors of the world , the birds singing, the sky up above and the feel of my feet crunching on the leaves and how despite my discomfort I was blessed beyond what I’m worthy. It’s been awhile since my last big post but had an experience recently that was too good not to post. I sustained a fall down 13 steps in my home about a week ago that left a lot of bruising but no breaks so I powered thru going to work and trying to keep up with the things I needed to do. Then on Monday the chest discomfort started and I rationalized it away as just another thing to deal with. But it became more intolerable and harder to function. I then decided to talk to my boss to ease up my work schedule this week and get a better treatment plan at my physicians office or a urgent care. Another manager saw the bruising and expressing concern wanted me to get worked up for a PE( blood clot in the lung). I couldn’t have a blood clot, I as a nurse didn’t want to be a patient, I didn’t want to stay at my hospital and get treated and I wanted to go home and sleep. I even felt like I shouldn’t be there and was talking myself out of going on every step walking over there. On the way there, the thoughts of my kids, others who went thru clots, classmates who died and didn’t get the chance, and those pts placed in my path who had complications from blood clots. So I clearly had an obedience problem, it was all about me as the paragraph shows with all the I statements. It wasn’t about me. With more health care professionals telling me I needed to be there, I decided to stay there despite the fatigue from the night before. My boss also called me to make sure I was getting treatment as the previous manager felt led to notify my boss. I’m pleased to report that I didn’t have broken ribs, a heart attack or a blood clot. My muscles and rib spaces are very inflamed and my pain is improving. God granted me the rest in my waiting so I could drive home. Recently due to an injury my life was turned upside down and everything I normally take for granted on a daily basis was now not in my control. And honestly, I didn’t quite know what to do to deal with it. And those that know me knows I don’t normally sit still very long. And patience is not a strong suit of mine either. It’s real easy in times of struggle to become angry or become upset and question what are the reasons behind it. Why me? Why now? Why?Why? Why? But the answer came to me that maybe I don’t know the reasons or the answers. Maybe I’m not supposed to either.But the doubt did creep in in the weaker moments. But in those moments I also found strength. This is a time for pausing in my life. It is what is designed for me at this time. Growing up my parents took pictures and had a few different cameras over the years. 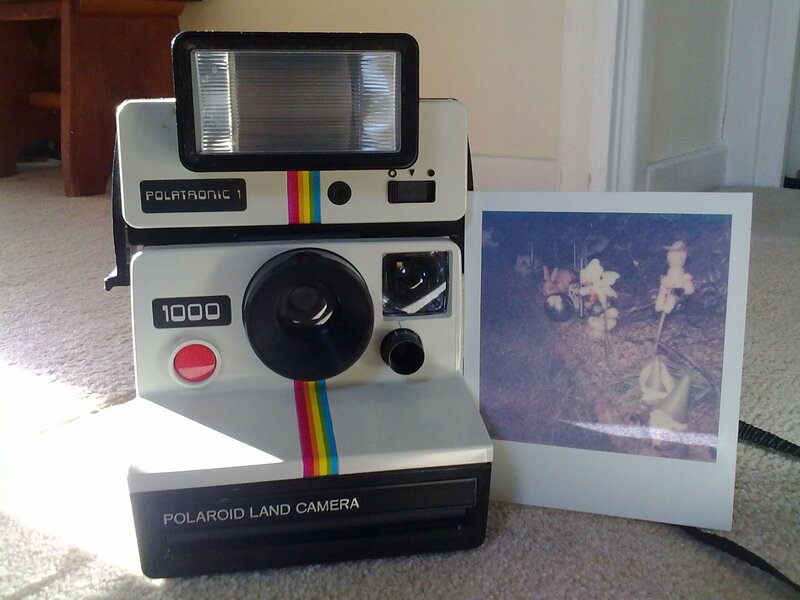 Being that I was a child of the 1970’s, a popular camera was called a Polaroid. Or Instamatic which I’m not sure was a nickname for it or a actual brand name. It had special film and after taking the picture, the image would appear on the film after a few minutes. I was often so excited to see this picture I would try different techniques to speed this process up like putting it near light, shaking the picture, or just walking around with it convinced I could make a difference. As a adult, I try mostly unsuccessful to speed up or facilitate the process of developing my personal picture of life. Like the childhood techniques with the Polaroid, they don’t work, are time consuming, and I end up exhausted from the effort. My lesson in the faith dare study is that you can’t get the picture God has for your life any faster than when it is exactly ready to develop. Asking for something, trying to rush it or force it doesn’t bring it on any faster. It’s all about knowing that God knows us perfectly and has the total picture and it will be revealed to us in his time. As the writer in me and new to blogging, I realized I left you hanging. Without my stuff, I would not be emotionally or spiritually where I am today. I’m blessed by God and the amazing people who I have met along the way. So James not yet on joy but happy is a very big step along the way. Honestly, I was thinking James was a little crazy. Joy in trials how could this be even possible. Analyzing my events, that was going to be a impossible feat. Had I seen in others on a TV program or in headlines. People whose personal set of circumstances was far worse than mine of course. But me, never thought it would happen. But that’s what I discovered today on this very early morning on a family getaway when up early for other reasons,I was relying on my understanding. Up this early morning on a family getaway for a complete different reason perhaps to finally get what this passage was referring to. It was referring to faith which I was lacking that day. Doing a new study called The Faith Dare, this came full circle. I was relying on my understanding not God’s. Consider it a sheer gift, friends, when tests and challenges come at you from all sides. You know that under pressure, your faith-life is forced into the open ans shows its true Colorado. So don’t try to get out of anything prematurely. Let it do its work so you become mature and well developed, not deficient in any way. I heard that and many other things growing up from my mother. I fully agree with that. Words can be painful at times but once said can’t be changed. Then the whole part of asking for forgiveness comes in which can be hard and take many people years. It’s much easier to think what you want to say before speaking. Yes my mother was right and I thank her for that great lesson which I can admit I have to struggle to follow at times. A journey of a mom of three in discovering herself and growing in faith.